My 13 year old dog has become so scratchy lately in the heat. I've tried so many products and I am so glad I found Augustine SuperBath as it settled her done after the first wash. It feels good bathe her in something so natural. My dog has an itch, the cause of which is unknown. Although she is on a raw diet and we avoid chemicals and pesticides as much as we can, she has developed a strange itch, dry skin and sometimes suffers from hives. There doesnt seem to be an answer to why it is happening to her. We have been using Augustine's SuperBath every second day and it has been relieving her itch! So far it is the only product that has helped. Over the past 12 months my Doberman Angel started to have reactions to certain grasses. Her skin turns red with little raised lumps followed by itching which then turns into broken skin. She is so uncomfortable, not to mention how frustrating it is watching your dog scratch. In the past I've resorted to antihistamines just to give her some relief and this went against everything I believe in. I then discovered Augustine's SuperBath and it provided her with instant relief. As soon as I notice the itching start I'd brew up a batch of Augustine's SuperBath and bathe her in it. I am so suprised at how quickly it works! The redness disappears and she immediately stops itching. I'll also take this opportunity to mention Augustine's SuperBoost. WOW! Everyone comments on how healthy my dogs look. They have so much energy and I just know they feel great. We've been using Augustine's SuperBath in conjunction with Augustine's SuperBoost and Faith and we are seeing amazing results. I love the fact that Augustine Approved products are natural and do not contain chemicals. We are so pleased to have our Golden back! Gypsy, our 10-year-old Golden Retriever had been suffering from very itchy skin. She had always been prone to hot spots but lately they had been more frequent and Gypsy started to scratch constantly. It was driving her crazy and we were vacuuming every day because she was shedding bucket loads of fur! All we ever heard at night was the persistent thumping of her legs as on the floorboards as Gypsy scratched, followed by her little whimpering cries. After two weeks of using your virgin cold-pressed coconut oil, Augustine’s SuperBoost and Augustine’s SuperBath all I can say is wow! The scratching has ceased and I am sure it's not a coincidence! It’s an amazing result and we are so pleased to have our Golden back. Our vacuum cleaner is also extremely happy to have a break! Not to mention that Gypsy’s coat is gleaming again. 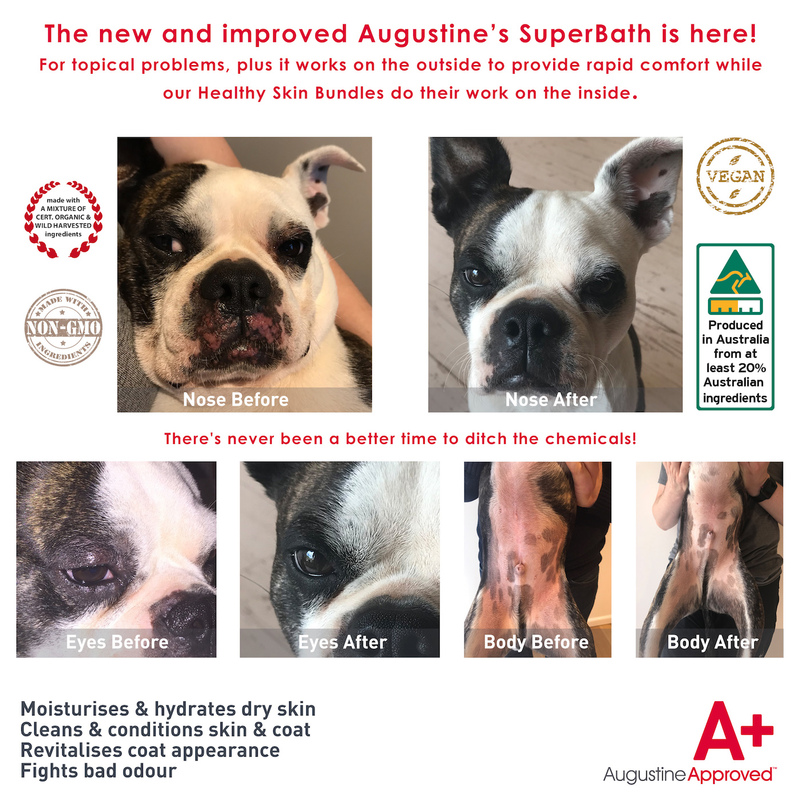 I used Augustine's SuperBath for the first time last night on my staffy who has bad skin allergies / irritations. Within a matter of minutes he had stopped scratching. The redness in his skin disappeared as well. Today he has hardly itched at all and I can't believe the change in him! I've only used product once but I am hooked! It's so easy to use as well. Both dogs benefited greatly from all three products. 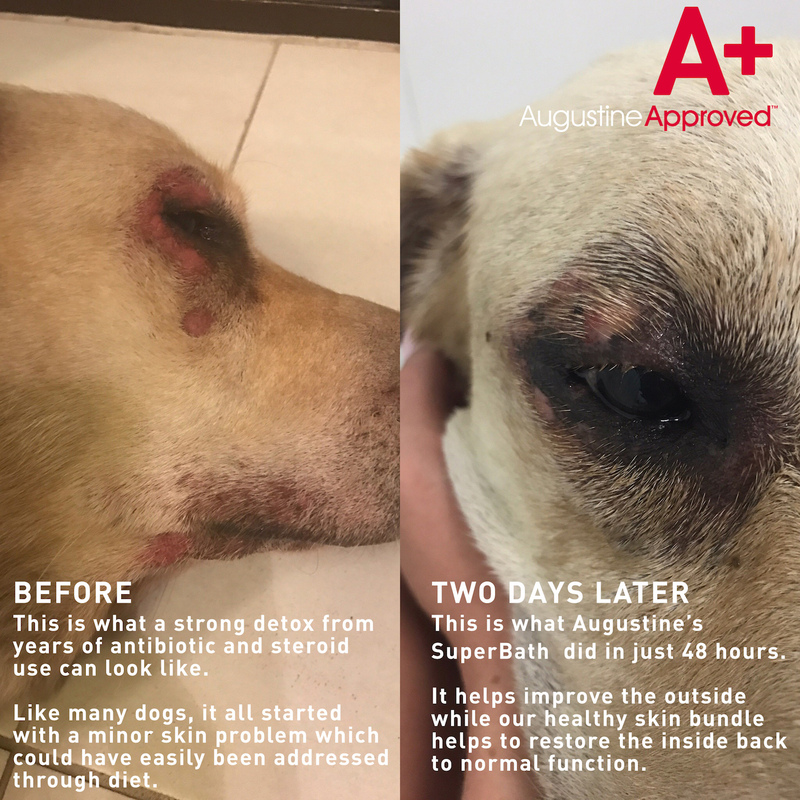 I used Augustine’s SuperBoost and Augustine Approved Virgin Cold-Pressed Coconut Oil on two little dogs that came into Animal Rescue Queensland in shocking condition. Arlo who is a little poodle x (12 years of age) was blind and deaf and had a terrible flea allergy causing him to loose most of his fur. Sixpence is also deaf and had a shocking skin condition due to fleas. I used Augustine’s SuperBath to help with the itching and inflammation of the skin with great success. I also rubbed the coconut oil on some of the worst spots where the dogs were chewing at themselves. Not only did it help them physically but I believe it also helped these dogs mentally. Their coats grew in beautiful and soft and their skin lost that horrible stench. Arlo even began to play and frolic around with the other dogs and is now in a better position for surgery on his eyes to restore his sight. I was so impressed with the products I am now using then on my own dogs and recommend Augustine Approved to everyone. My pups suffer from skin issues during the summer so I tried Augustine's SuperBath. After one bath there's definitely a lot less scratching. Calendula Flower baths, Augustine's SuperBoost and Augustine's SuperFood have all combined to make Albie a very happy dog. Which makes me a very happy lady! I used the Calendula Flowers on my husky’s coat and I loved it! Her coat was very white and fluffy. I like the fact that it is all natural and healthy for her. I would recommend this product to anyone who wants their dog to look their best and feel their best!